Review: Korean filmmaker raised in L.A., So Yong Kim (“Treeless Mountain”), returns with another minimalist independent film. 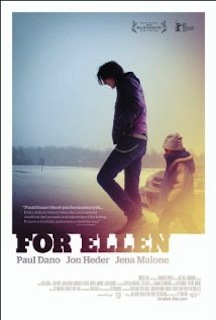 “For Ellen” tells the story of Joby Taylor, a long time traveling musician who drives into a small, snowy town to gather in court with his estranged wife, in order to sign the divorce papers. For a couple of hours, he is allowed to meet with his six-year-old daughter for the first time. This incident will change his life forever and nothing will be the same after that. Paul Dano has a terrific performance as a wobbly and repentant father, whose life has changed completely in a short period of time. The conversation with his daughter conveys a touching honesty that stayed with me for a while. There is also a strenuous scene that marks this film, when Dano dances completely drunk in a bar, at the sound of a Whitesnake’s rock song, leaving his lawyer perplexed. With a loose, nearly dreamlike cadence, “For Ellen” feels credible and genuine. Its leisurely pace might drive off many viewers, but actually, it manages to show sensitivity without being corny.